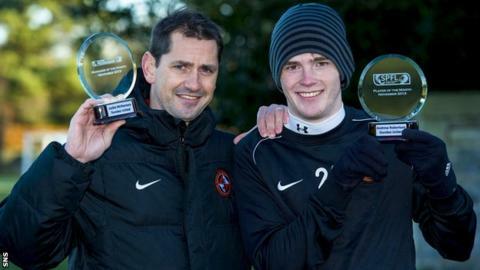 Dundee United's Jackie McNamara has been named Scottish Premiership manager of the month for November. McNamara's side won two top-flight games and drew the other away to leaders Celtic during the month. The manager said: "For me, it's about the team and how they've performed. You're nothing without your team. "I've got a great dressing-room there and not just the ones that are starting but the ones waiting for an opportunity and this goes to them as well." After a stoppage-time equaliser denied United a victory at Celtic Park, they went on to score 13 times in their three following games. They fired four for no reply past Motherwell at Fir Park before a 4-1 win over Partick Thistle lifted them into fourth place in the Premiership table - and a 5-2 defeat of Kilmarnock in the Scottish Cup. Robertson won his award after his rampaging runs out of defence led to four goals during November to take his total for five in his first season in top-flight football after his summer switch from amateurs Queen's Park. "I could not have asked for a better start," he said. "I had to get used to the full-time training and I need to pay a lot more attention to recovery as you could not recover fully because you were working on the Monday. "But I've been put in at Partick Thistle to start and I was happy with that and I'm just glad I've kept my place in the team. "Everyone likes going forward, but when we keep a clean sheet, I get a buzz out of it and the whole defence is happy. "If a footballer doesn't like scoring a goal, they shouldn't be playing. I like scoring goals and creating goals, but the defence is my priority." Robertson is enjoying the style of play encouraged by McNamara. "He wants us to play the right way, he wants us to get the ball down and play," said the 19-year-old. "But me getting forward, I have to pay tribute to John Rankin because he's the one that covers me when I go forward. "Maybe it's not the best for him, but if he's covering me then it's a lot easier for me to get back." Robertson was honoured to have beaten so many more experienced players to the monthly award. "It's massive to me," he said. "Winning player of the month is recognition that I've been playing well. "I know I have been playing well, but it's nice to be recognised. "My mum and dad follow me around the country and hopefully this is paying them back a wee bit."